Route 97 will make all stops between Westlake and SeaTac Airport except Beacon Hill and Mount Baker, which will see no replacement service. Due to SDOT construction, riders at Beacon Hill and Mount Baker should prepare for additional travel time and reduced frequency. Route 36 (22 minutes) is 69% slower than Link (13 minutes) between Westlake and Beacon Hill, while Route 7 (30 minutes) is 100% slower than Link (15 minutes) between Westlake and Mount Baker. In addition, cash payers headed to Beacon Hill should plan an additional $.25 fare, as Route 36 is $2.25 vs. Link’s $2.00. Finally, riders headed to Mt Baker from SeaTac, Tukwila, or the Rainier Valley should be prepared for a transfer to Route 8, which runs every 15 minutes during the day but only every 30 minutes after 7:30pm. At the time of publishing, there is no information yet on Metro’s alerts page, but Sound Transit sources confirm that this will be a full closure of the Downtown Transit Tunnel as well. Riders on weekend tunnel routes (41, 71, 72, 73, 101, 106, 150, 255, and 550) should board at designated surface locations. Sound Transit staff will be on hand at Westlake to help direct both ST and Metro passengers to appropriate stops. [The] Supervisory Control and Data Acquisition (SCADA) system [is] being upgraded. It’s the system that essentially tracks and can control where all the trains are on the line at any given moment. The upgrades include new displays and hardware at the Link Control Center and the communications software and hardware system wide that talk to the LCC. We may also have to do similar shutdowns in the spring as we upgrade the emergency ventilation systems and building management systems for the underground stations. Think of it like going from Windows 95 to Windows 10. It wasn’t an easy decision to take the entire line down for these upgrades, but the more the engineers looked at it, the more sense it made to do the cutover over the span of one service day instead of piecemeal during the brief overnight maintenance windows. Sound Transit’s full release after the jump. On Saturday, Nov. 15, the entire Link light rail line will be closed for system upgrades to prepare for extending service to Capitol Hill and the University of Washington in early 2016. If possible, we recommend that you adjust your schedule or use alternative travel options such as taxis and shuttles. To Airport: Get on the bus at 3rd and Pine downtown. To downtown: Board at the bus stop at International Boulevard and South 173rd Street near the Link station (follow this map). To Downtown/Westlake: Board Route 36 north. 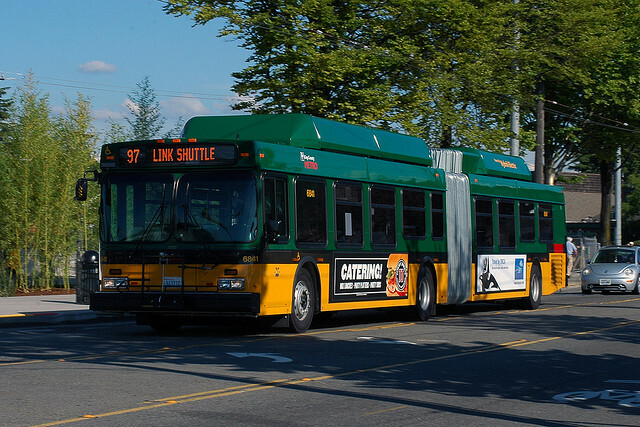 To Sea-Tac Airport: Board Route 36 south and transfer to Route 97 at Othello Station. To Downtown/Westlake: Take Route 7 north. To Sea-Tac Airport: Board Route 8 south at Mt. Baker Transit Center and transfer to Route 97 at Columbia City Station. After 12:27 a.m., board Route 7 south to Columbia City, walk to Columbia City Station and board Route 97. For live updates during the closure, follow Sound Transit on twitter at twitter.com/SoundTransit. Thank you for your patience during these upgrades. What specific sort of systems upgrades require shut down of the entire operational transit network? The post has been updated with more info from ST. Does this mean we get real-time arrival? Doesn’t sound like it — if that statement, which mentions new information displays in the Link Control Center means “we get real-time arrival info”, then ST has buried the lede to a ludicrous degree. This seems very amateurish. I can’t imagine this would be acceptable for 99.9% of all other rail transit systems in the world. Is there more to this? It’s not as if Saturdays are particularly light use days for Central Link. I would disagree with that characterization. One total shutdown eliminates all of the startup-shutdown time that would be needed if work is spread over multiple nights, and also allows for other work to be done on the track (cleaning, repairs, inspections) that would’ve either not happend or been disruptions of their own at another time. NYC MTA has realized that major night-time shutdowns (MTA calls it FASTRACK) over several consecutive nights (e.g. 10pm-5am Monday-Thursday) are highly efficient ways to conduct major infrastructure upgrades, repairs, and cleaning on subway lines. Boston shut down the entire Government Center station (in the middle of downtown) for 2 years to reconstruct it because it was cheaper and easier than having ongoing partial closures. DC Metro closes some segment of the subway almost every weekend for major track work. Just pull the bandage off and get as much done as possible. Yes. One-three saturdays per new line opening is fine. Na, this is pretty much how it is done when these major upgrades/changes/maintenance need to be done. I’ve been surprised more than once late on a Sunday by major shutdowns of various London tube lines. Of course they have a “system” instead of just one line, so you can usually work your way around any shutdown and get where you need to go. But if you are trying to catch your train out to the hinterlands it can be a bit of a surprise. But thanks for understanding how critical Link has come to transit in the Seattle area.You are right that Link availability is critical to the overall transportation puzzle, and any full shutdown of Link should be both infrequent and and short duration. On another visit I arrived at JFK and the A express was down for the weekend so I took the local and it took an hour to get downtown. Then I had to go back to the airport the next day to deal with my lost luggage, so it was out and back again on the local. I think this is much better than making the line useless through partial shutdowns or headway-halving after 8pm for weeks on end. It’s quite smart to do this on a Saturday rather than a Sunday, since the Sunday Metro alternatives are so much more horrendous. I agree, I think ST is doing the right thing here. Agreed, getting it done all at once was the right thing to do. Too bad they couldn’t have done this with the pedestrian tunnel on Broadway. Hopefully we have a 2nd line through downtown in the not too distant future so that this kind of shutdown is less painful. Another advantage of doing it on a Saturday instead of a Sunday is that it won’t affect service to a Seahawks game. The Mariner’s are done for year. Not sure about the Sounders. I would not say that I “pine” for the 194 but it was superior for getting you into downtown. It’s faster than LR and it’s way more convenient than traipsing 10+ minutes from arrival gates to the airport terminus for LR. Of course this is only MNSHO. I hope ST has staffers not only at Westlake, but at the airport as well: imagine the annoyance of someone, groggily returning from an off-grid vacation, accidentally walking all the way to the airport terminus, only to find out that nothing’s running. Never having ridden the 194, I also wouldn’t know where to get on a bus from the airport, so signage / staff pointing that out would be useful as well. They would just walk down the stairs. It looks like the 97A will stop at the RapidRide stops on Pac Hwy S, not at the south end of the terminal. According to ST, they will have staffers at all stations, and will even be helping airport travelers load luggage on the 97A. Any time there is a sreview disruption alerts are present throughout the system on the displays. So it will be obvious that link won’t be running that day. I would hope some time there would be a moving sidewalk to connect with the Terminal, or a shuttle bus from the luggage area. The latter is how it is done in Boston. I would think the added cost of these options would be repaid by additional ridership. Any thoughts about improving this ‘link’? I have become soft taking Link to SeaTac. I am headed to the airport that day and am glad that ST will remind me of how things used to be. It will also remind people what transit in Ranier Valley and Beacon Hill were like before Link. In what world is this an acceptable detour? The world where it only occurs after 12:27 AM? Is there really an appreciable number of passengers boarding then at Mount Baker on a Saturday night? I’m glad that ST put this important alert smack-dab on the front of their homepage. Usually they hide things in the lower right corner or make it difficult to find. I was hoping the 97A would serve Tukwila Int’l Blvd Station in addition to the airport. It’s gonna be a long ride for Tukwila riders. Might be faster to get to TIBS by taking the airport express then backtracking on the local or the A line. The 124 is probably faster than either for heading downtown, unless there’s an event causing serious problems on 4th Ave S.
If 97A is dropping off where the 574 drops off, you’ll have to walk out on Arrivals Drive and cross International Blvd and then walk another block north. I think the real lovers will be those walking from 176th if they’re going to have to walk all the way down to the other end of the terminal. Why doesn’t 97 serve Beacon Hill and Mount Baker? I get that there is no route that can serve Beacon Hill + SODO at the same time (without a lot of backtracking). So, it seems like the options are serve either SODO or those two. SODO I know has basically the lowest ridership in the system, so it seems weird that they would choose to serve SODO rather than Beacon Hill / Mount Baker. I think serving Sodo should be the lowest priority on a Saturday especially, and that these shuttles should serve Mt Baker, McClellan St, Beacon Hill, and then Stadium via Holgate. [Edit]Here is the construction project on Beacon that caused the 97 to miss Beacon Hill and Mt. Baker. I’ve added it to the post as well. Turn south on Rainier and stop at Beacon Hill Station. So ST has chosen to skip two stations entirely in order to save four-tenths of a mile of travel distance. And that’s only in one direction, as they can still use Beacon Ave/Holgate for the northbound trip. It’s probably more about using Columbian Way to keep travel time from being abysmal with stoplights and traffic, and SODO happens to be along the way. Holgate/Beacon is down to a single lane, westbound only while a new sidewalk is put in from the Mountains to Sound trail end up to 15th. It’s completely closed uphill, and that’s the only route from SODO to Beacon Hill Station between Jackson and Spokane. Is the steep part of Beacon Avenue even wide enough for buses? Thanks for this unbelievably important public service, Zach. Any chance you and STB could get the contract for all transit information for LINK and KC Metro? Really, since its inception has been doing a great deal of this- from staff and commenters both. Nothing as good for bringing about needed change as an example. There was a soft announcement at the last meetup. Can we have realtime arrivals now? This clearly states they know exactly where all the trains are so let’s make that available to everyone. If November still manages to maintain double-digit year-over-year growth, despite a day of zero riders, I will be truly amazed.